Giant tortoises with horns and spiny tails and gigantic birds that could not fly. Unfortunately, for the animals, these encounters often led to their extinction. Not used to running away from predators, they were easy prey to hungry sailors. Explorers also brought along their ship rats, pigs, and cats, which ate the eggs of flightless birds laying on the ground. But how bad was it? What are the consequences of these extinctions? And can we identify what animals or islands are most at risk? First off, it is not only the animals themselves that are affected. The extinction of island animals in turn affects the plants that co-exist on these islands. This is because many birds, mammals, and reptiles perform a vital service to the plants by eating their fruits, which contain seeds. After a while, these seeds will come out again and land somewhere else. This is how many plants move between different areas and make sure their little seeds can grow up in a good spot. If there are no animals left to spread seeds, the plants are at risk of becoming extinct themselves. An island without animals and plants would be a lot less exciting than what the early explorers encountered. In our research, we wanted to know just how bad the situation was for fruit-eating animals on islands across the world. Were some animals more likely to go extinct then others? Have there been more extinctions on certain types of islands? Together with my colleagues Daniel Kissling and Emiel van Loon from the University of Amsterdam, and Dennis Hansen from the Zoological Museum of Zurich, we investigated data from 74 islands across the world. We wanted to get the full picture, so we looked at all of the birds, mammals, and reptiles that eat fruit. We also included animals that have recently become extinct. We checked to see whether the island size and remoteness could explain differences between the numbers of extinctions that we found. Then, we compared characteristics between the animals that had gone extinct with those that survived, such as differences in their weight and whether or not they can fly. We saw that large animals that cannot fly go extinct more often than any other. The Dodo bird on Mauritius is a famous example. But interestingly, we saw a knock-on effect of such extinctions. 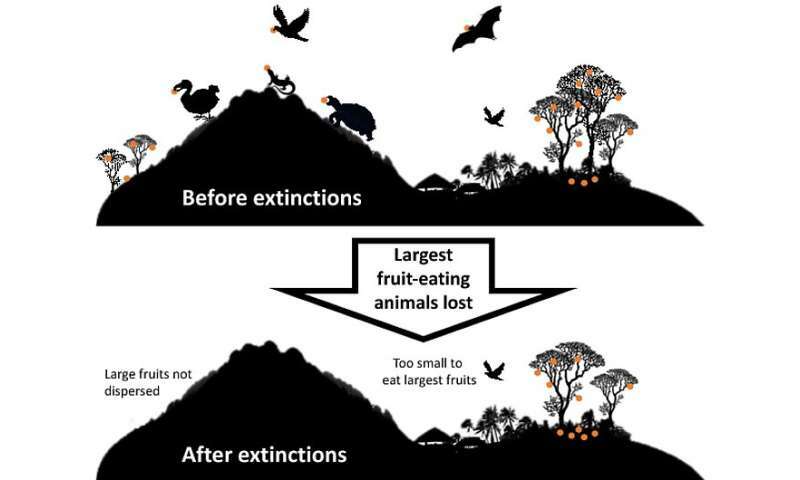 In fact, the mean weight of all fruit-eating animals on islands has reduced by 37 per cent due to the loss of large animals, such as a giant bird on New Caledonia, several large flying foxes and some of the Galapagos giant tortoises. Many of the islands in our study have lost their biggest fruit-eating animal and sometimes also the second biggest. Today, only the smallest animals remain. Our data show that the largest animals that can be found on islands today are 51 per cent smaller than the largest animals that used to live there. The loss of so many large fruit-eaters is extra challenging for the plants. This is because large fruit-eaters have larger beaks and mouths and can swallow the largest fruits. The smaller animals that remain on the islands today are simply not capable of swallowing and dispersing large fruits. This means that the seeds of large plants are less likely to end up in good growing spots and make little plants of their own. Soon, we may not see many islands with such large trees with large fruits. Luckily, not all islands have lost their fruit-eating animals. But the smallest islands have suffered most, and have lost the largest percentage of the fruit-eating animals that used to live there. This is probably because it is more difficult to escape predators and hunters on small islands. Plus, compared to larger islands, they have relatively little forest and fewer fruiting trees to eat. So, any problems that occur on small islands can easily have a big impact. 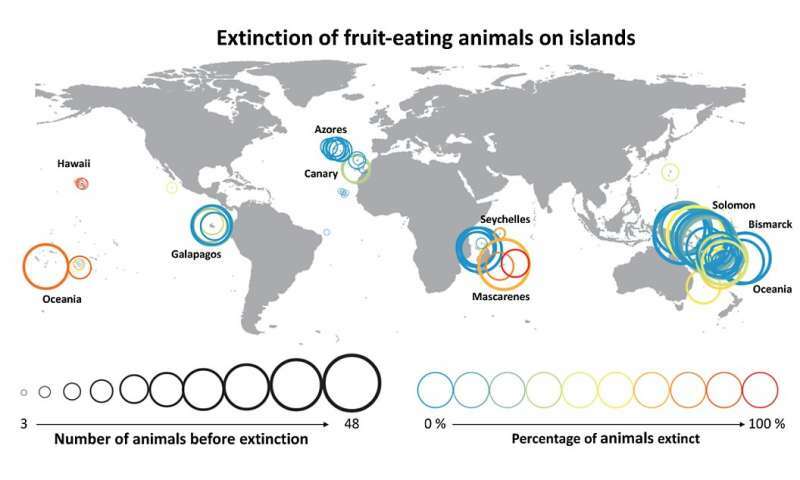 Isolated islands, far away from the mainland have also lost a large percentage of their fruit-eating animals. Again, these animals have lived without predators for a very long time, making them extra vulnerable to hunting by people and accompanying rats and cats. All these extinctions are of course very sad, but they are certainly no reason to give up hope! We now know what animals and islands are most at risk: large animals that cannot fly, such as the Solomon flightless rails and megapode birds, on islands that are small and remote. And we now need to use this information to help prevent extinctions in the future. Many organizations are working very hard to do this, and there are some great success stories of islands that have been restored to the way they were before humans arrived. But a lot more effort is needed and anyone can help, either by volunteering for projects, donating or simply spreading the word. Hopefully, we will not lose the many exciting island animals and plants that we still have, and we can continue to be amazed, just like those early explorers. If a species of animal on a remote undiscovered island goes extinct without anyone noticing, does it make any difference to anyone?